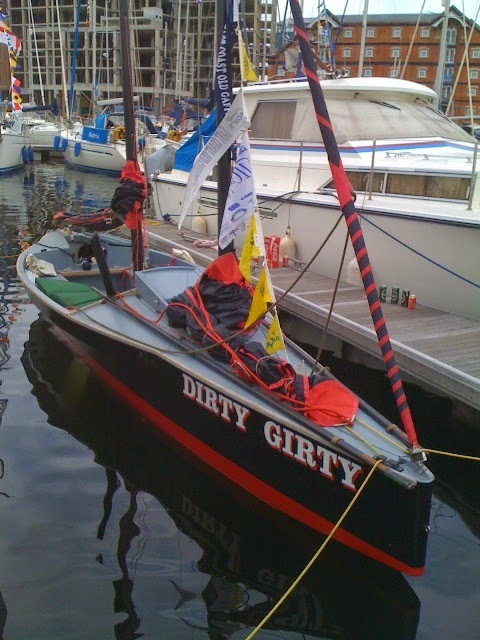 A day sailer is essentially a sailing boat that has no living accommodation, or sparse accommodation. 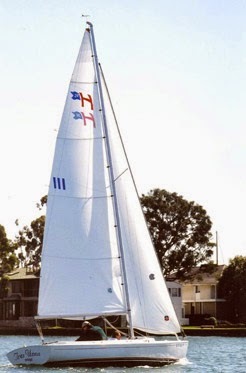 A Harbor 20 is one such sailboat. 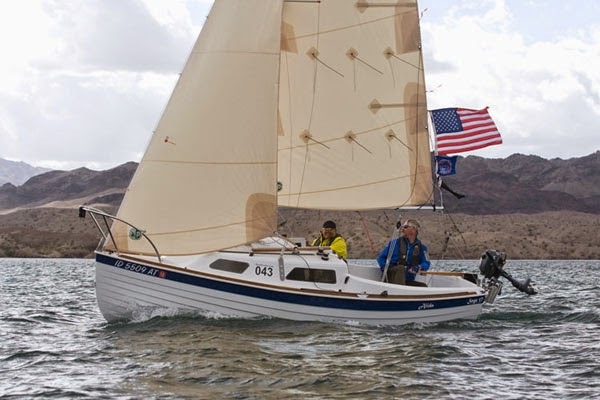 She and similar day sailers like the Squib, Ajax and Yeoman can be used for Spartan cruising with the addition of a boom tent, and minimal camping equipment. 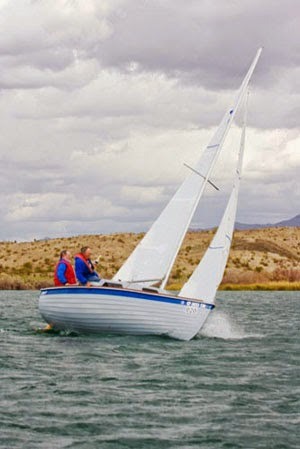 These boats are raced; indeed, they were primarily designed for racing and occasional day sailing. 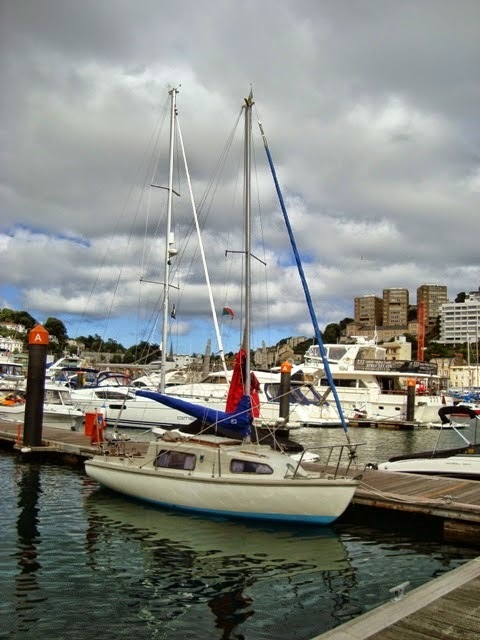 Small cruising yachts such as the Leisure 17 and the West Wight Potter are also suitable for day sailing. 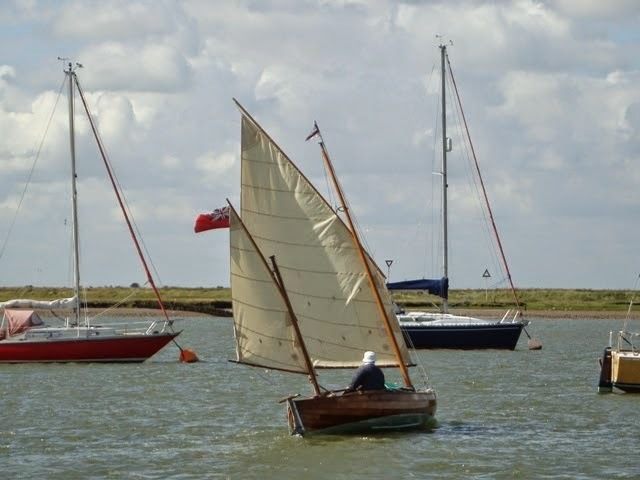 There’s a lot to be said in favour of day sailing, because it is the least demanding form of sailing. 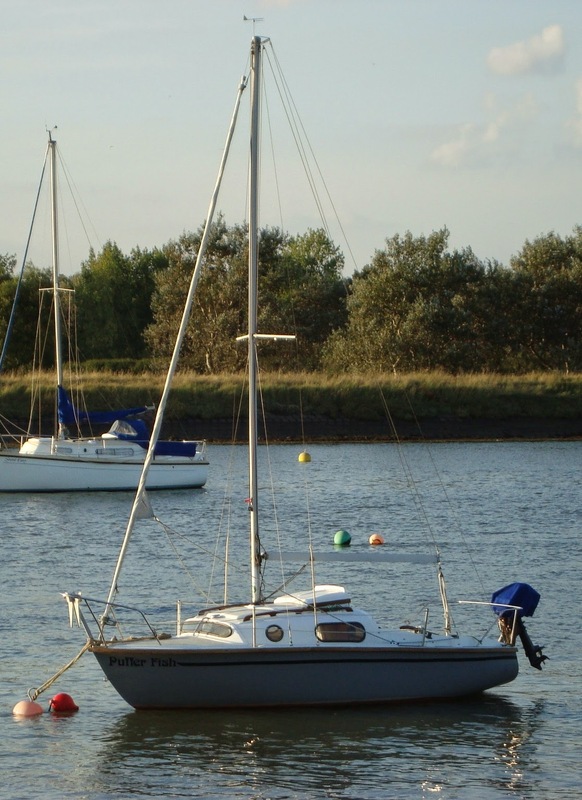 Good weather can be chosen when the tides are suitable for a few pleasurable hours afloat, unlike cruising when it may be necessary to sail in conditions that are far from ideal. I was recently approached by a person who wanted to buy ‘Minnow’. 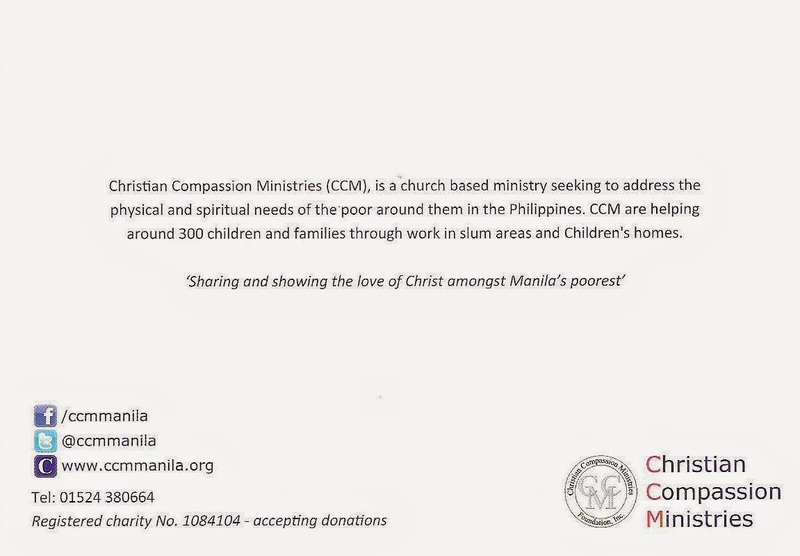 He suggested a sum of money and asked what he would get for that amount. 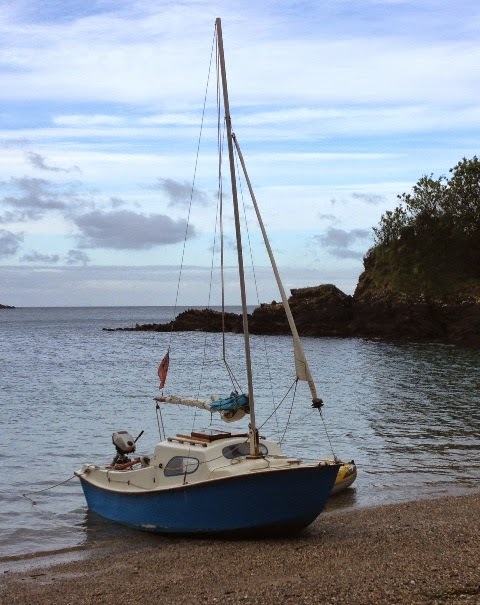 I replied that he could have the boat, minus most of her gear and the engine and without her trailer for less than he had suggested, but if he offered an extra £300 he could have the same package including the trailer. Bearing in mind the trailer originally cost £1,092 I felt he would have had a bargain. I was surprised therefore, that he reacted by telling me that ‘Minnow’ was expensive, and he would not be pursuing his interest in purchasing her. 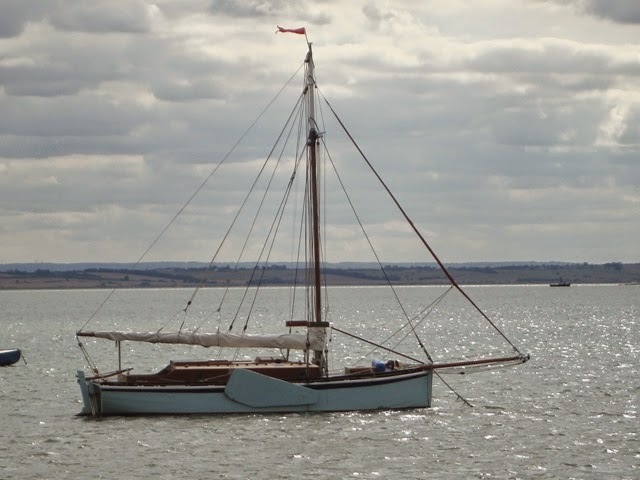 One thing I could understand was that he would have to do a two-way trip across the English Channel by ferry to collect ‘Minnow’ and take her to his home. Bearing in mind transportation costs, perhaps for him it would have been an ‘expensive’ exercise. However, at the time he suggested an amount he was prepared to pay, he would have been aware of the expense of collecting her. 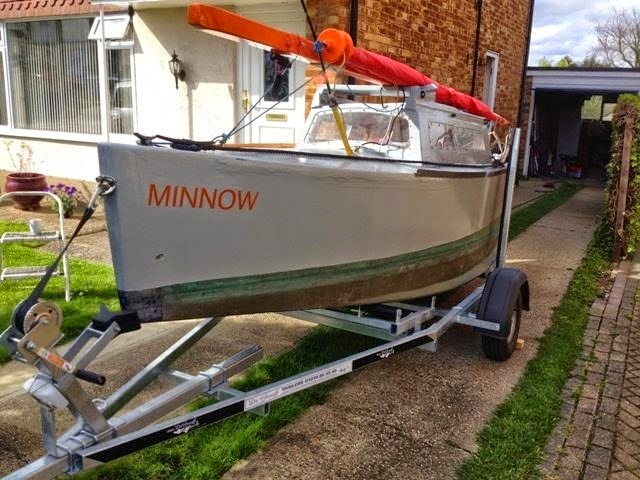 I have noted comments on the blog regarding the proposed sale of ‘Minnow’ when originally advertised at Ebay for £2,900 with all of her gear, including the engine and road trailer. Commentators intimated I was not asking enough! And what I was offering was an absolute bargain. 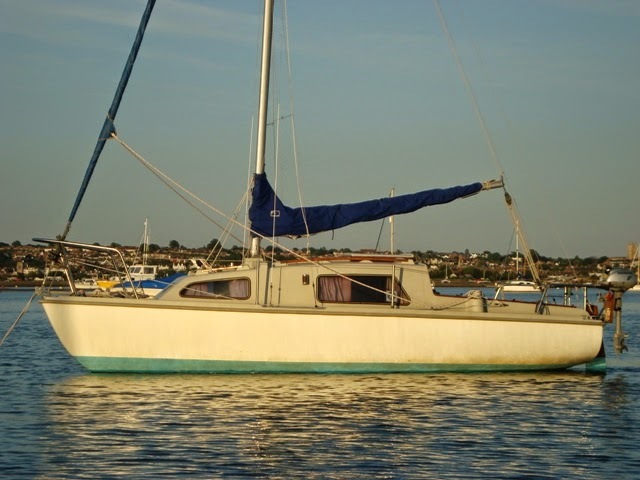 Well, the truth is that I want to cover my costs and hopefully a little more for the labour lavished on renovating her. Anyone wanting a Paradox should note that to build and fit out one, it will require the expenditure of well over £4000 - more likely in the region of £4,500 without a road trailer. 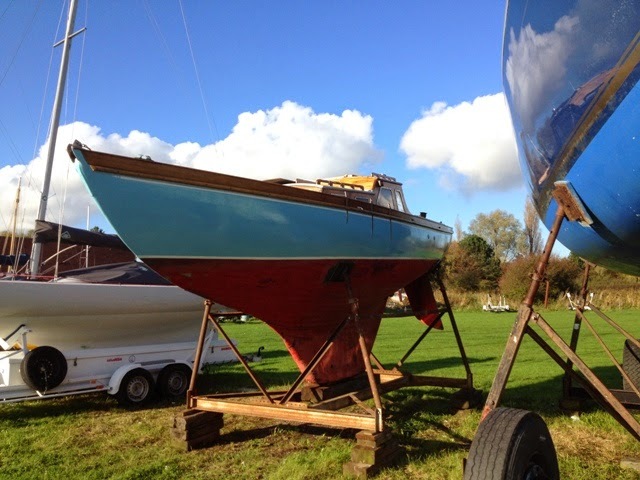 Furthermore, it will take the builder about 18 months of his spare time, working evenings and weekends to complete her. I am still offering ‘Minnow’ for sale, and I am open to reasonable offers according to what will be included in the deal. 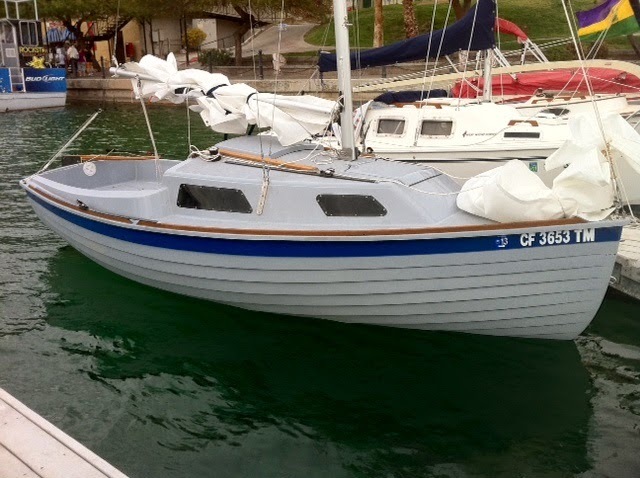 Come the spring of 2015 she may not be for sale, because I may have overcome my lack of desire for being on the water. I may have regained the confidence I once had. I may again be looking forward to the challenge of long distance coastal sailing, or even to being satisfied with cruising locally. When one says that a thing is too expensive, it must be seen as a relative statement. For one person it would be cheap and inexpensive, but for another who is not so well off, it could indeed be expensive. I am fascinated by sailing boats. I could look at them all day long. Here are a few more* I like. 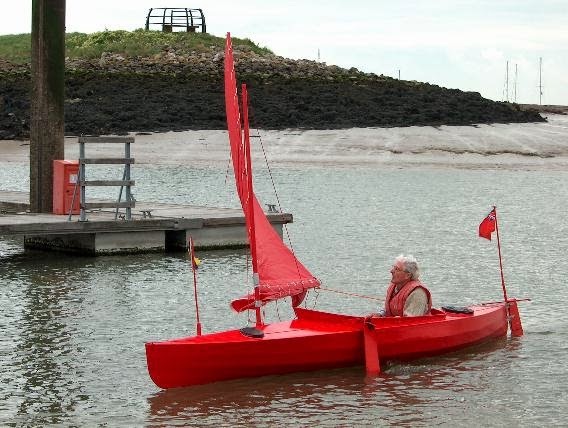 The first is a 50/50 sailing and paddling, decked canoe built by me, according to a design by Paul Fisher whom I commissioned to produce plans for building her. I wish I had bought a stake in the royalties from the sale of plans, because I would have had a few pounds accruing to my account. 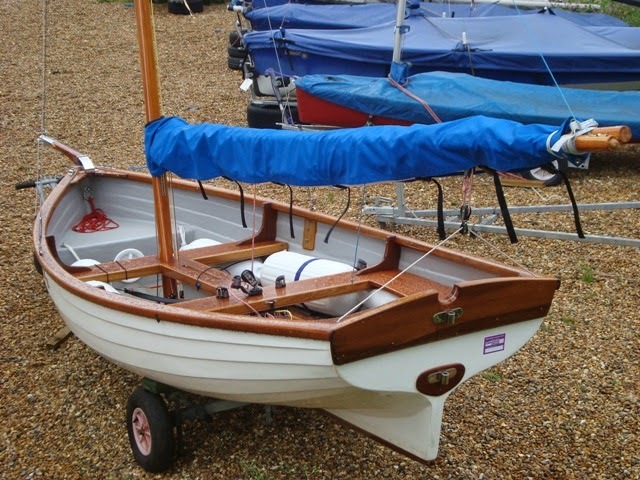 The second is a Fairey Atalanta with twin retractable keels designed by Uffa Fox. I admire the standard of build that was achieved by the hot moulding process of bonding veneers of wood together. I owned a Fairey Fulmar, her smaller sister. 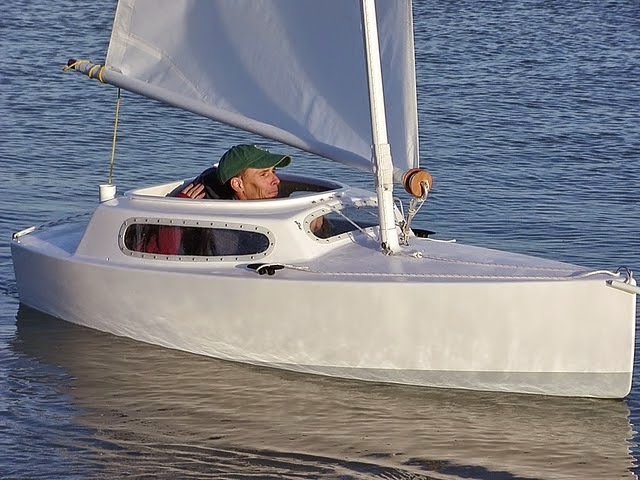 The third is a Bolger Birdwatcher designed for shallow water sailing. 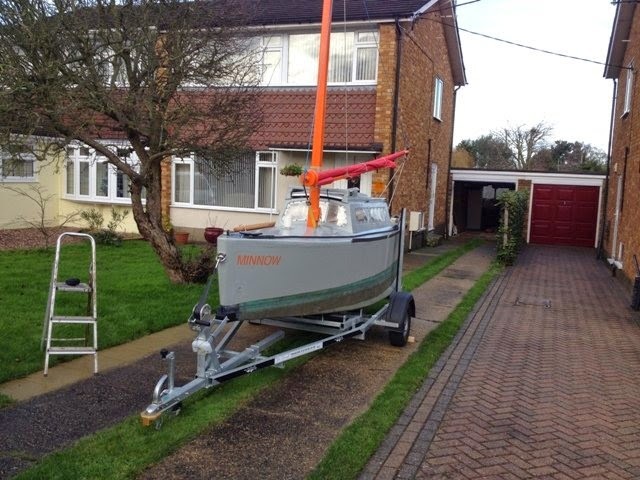 Although longer than many trailer sailers, she can be towed behind a suitable vehicle on a bespoke road trailer. 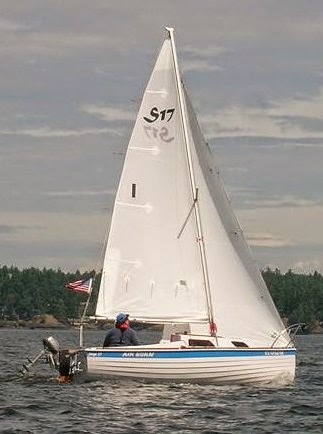 The fourth is a Contessa 26. These deep- keel cruising yachts designed by Jeremy Rogers have a good reputation for being capable offshore sailboats. 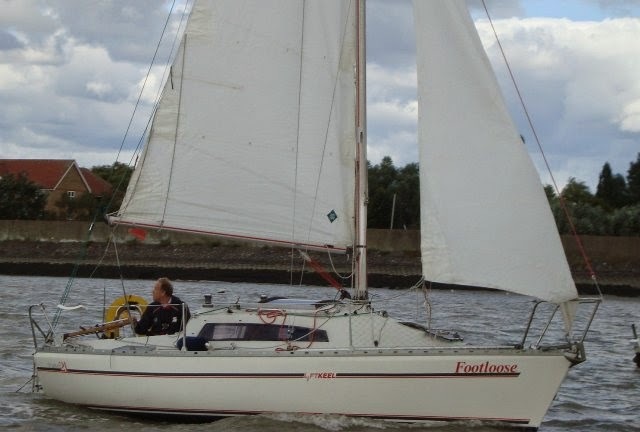 Anyone seeking a relatively cheap, well proven cruising yacht for two people could well consider adding her to their list of potential candidates. 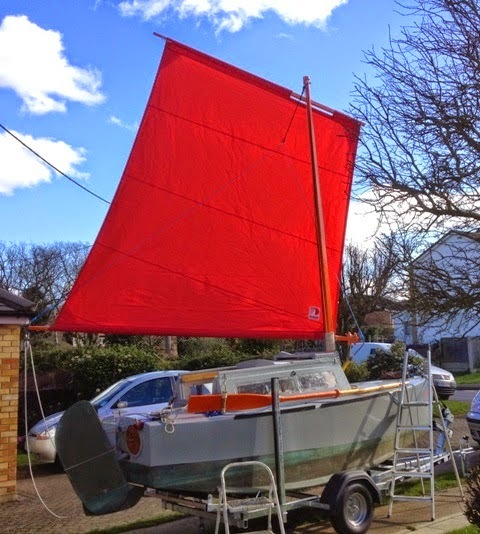 The fifth, a Parker 21, is a versatile trailer sailer with a good performance, suitable for a crew of two. 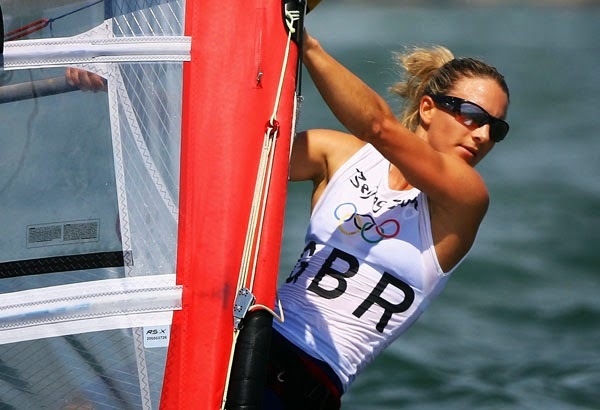 Bryony Shaw is a first-class windsurfer who won a bronze medal for Great Britain in the 2008 Olympics. She is currently the World No. 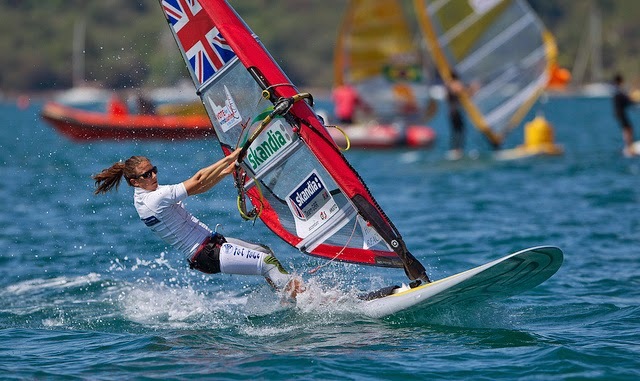 1 female RS:X windsurfer. 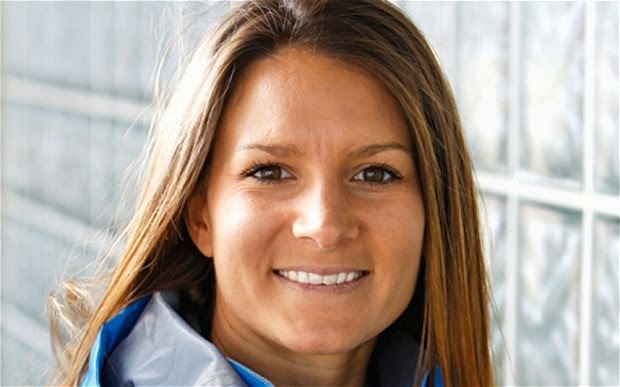 What makes her exceptional is her dedication to winning with much preparation, including ‘off-piste’ sailing at secret locations, such as out-of-the-way places on the west coast of Ireland. The freedom she gets from this experience of being in tune with the wind and waves adds a zest to her life beyond competing against her rivals. 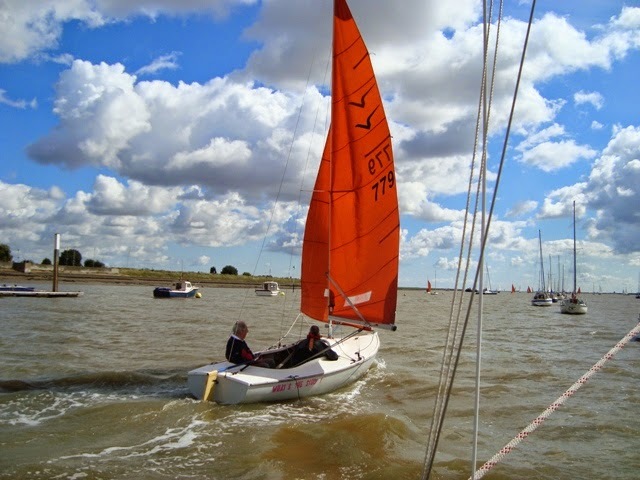 I find this approach refreshing when I consider the emphasis that is given to racing by official bodies such as the Royal Yachting Association and the International Sailing Federation. They have an almost myopic focus on racing, and pay lip service to cruising with little active promotion, and as for recreational day sailing little is said. I know of no one apart from Tim Batstone who has done coastal cruising on a board. No doubt there are others. The practicalities of this sort of minimal cruising clearly limits what can be done, but with the right backup and support it is feasible, as Tim makes plain in his book, ‘Round Britain Windsurf: 1800 miles on a 12ft board’. 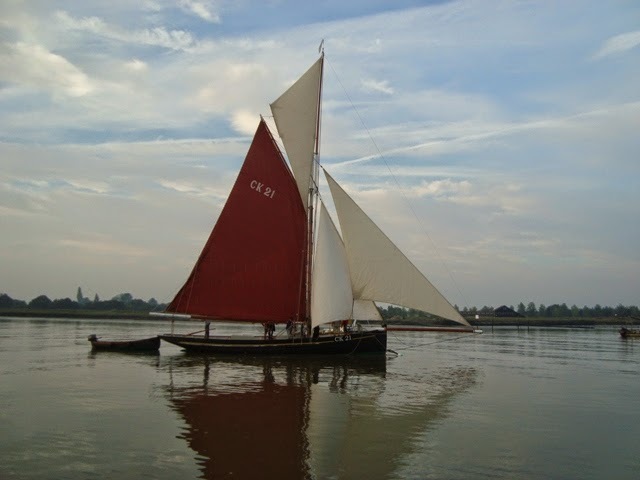 I have a passionate interest in sailing vessels, particularly smaller ones, the simpler the better. One of the simplest I have owned was ‘Acadia’. 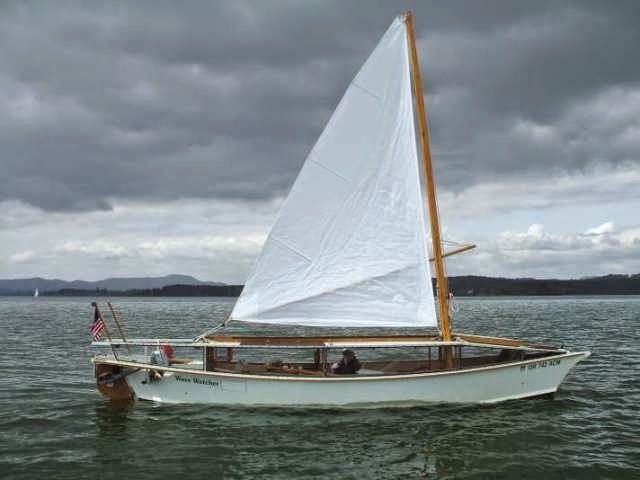 Originally she was not designed for sailing, but I rigged her with a small sail and a leeboard, along with a rudder. On account of not being as quick to react to situations requiring balance as I used to be when I was younger, I felt I was not up to managing the kayak, especially when under sail. Mainly for this reason I sold her to a younger and fitter man. I never heard how he got on, but I hope he had a lot of fun with the kayak. I’m a fan of Matt Layden’s boats, particularly his Paradox. I also like his tiny ‘Elusion’, which resembles a baby sister Paradox. 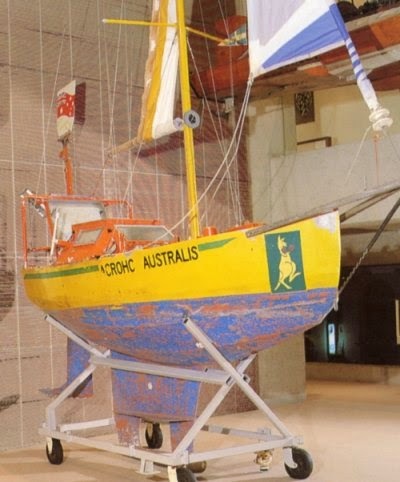 When I was on holiday in Australia I visited the Queensland Museum in Brisbane. 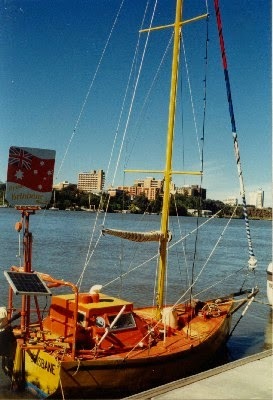 There I took photographs of Serge Testa’s ‘Acrohc Australis’, a homebuilt 11’ 10” aluminium sloop that he sailed around the world. 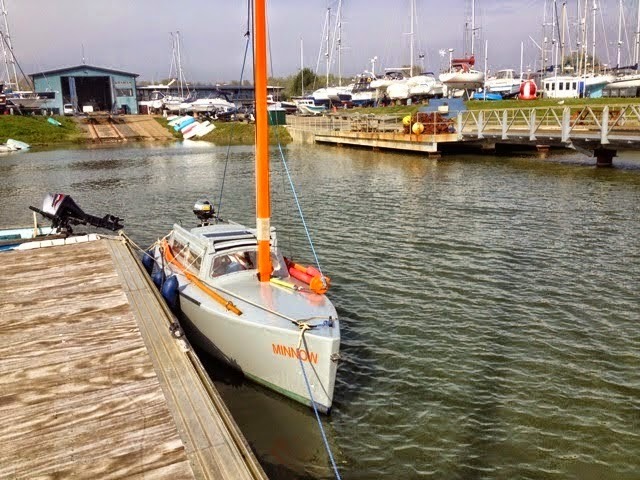 To date she is still the smallest boat to have done so, and Serge continues to hold the record for circumnavigating the Globe in the smallest sailing vessel. The shortest day of the year for those living in the northern hemisphere is today - the 21st December, 2014. We have the prospect of lengthening daylight hours until the summer solstice on 21st June, 2015. 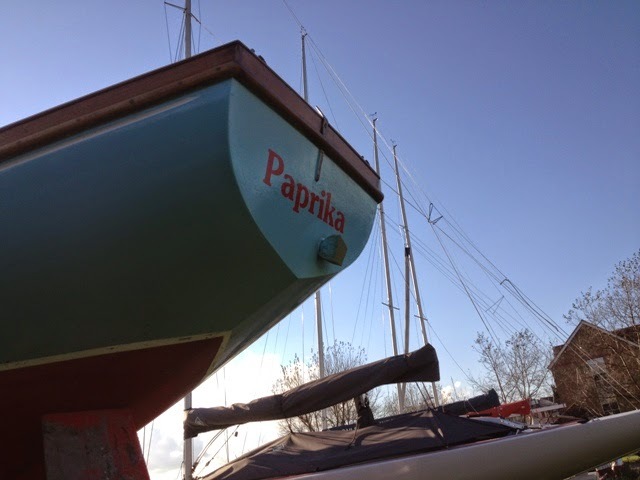 Most of us by now have tucked our boats away under cover for the remainder of winter, and we look forward to spring when we shall prepare and launch them at the start of a new season. Then many of us will launch our boats with high expectations of brilliant times afloat. 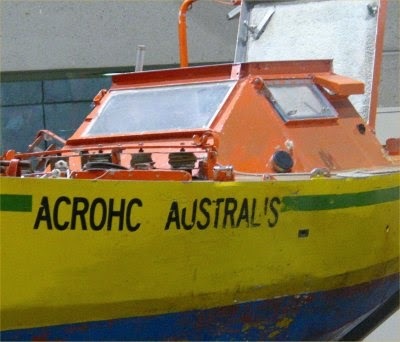 Just now, in the southern hemisphere, yachtsmen will be halfway through their season, and they will be making the most they can of the shortening days. 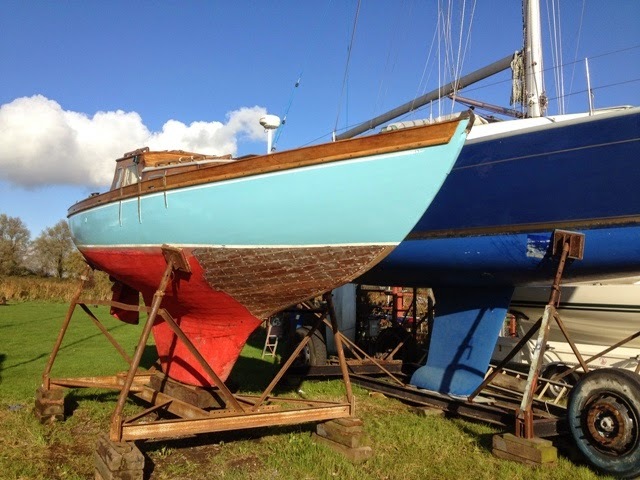 As a result of advertising ‘Minnow’ for sale on Ebay, a number of people have shown an interest in the possibility of buying her. A person who had previously seen her came today for a second look. He liked her, but it seems she is not a practical proposition for his particular situation, one of disability, and he has reluctantly decided not to buy her. 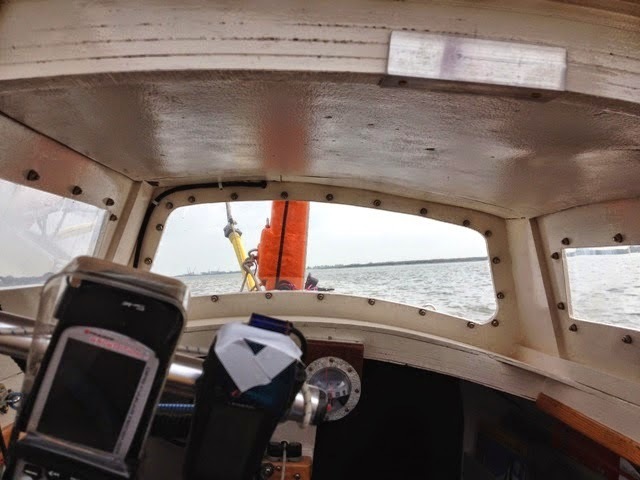 I was pleased he came a second time, because he could check out a few things – nothing to do with the condition or construction of the boat, but more to do with practical issues on account of his disability. 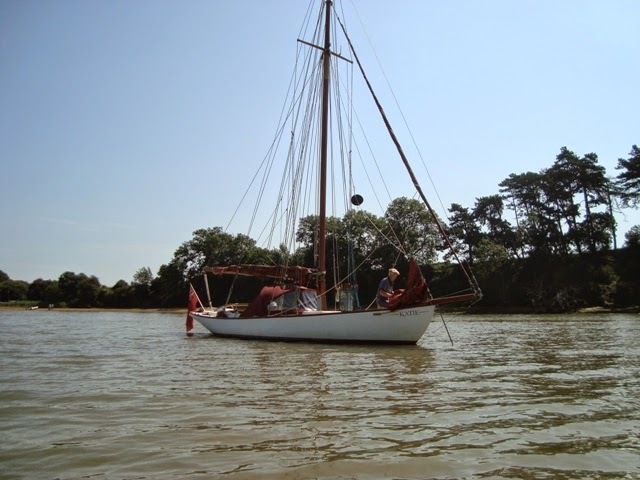 He said she was one of the boats he thought may be suitable for a disabled sailor, but getting in and out of her from a dinghy would not be the easiest or safest manoeuvre, and because of his disability he discovered he could not access the fore cabin. 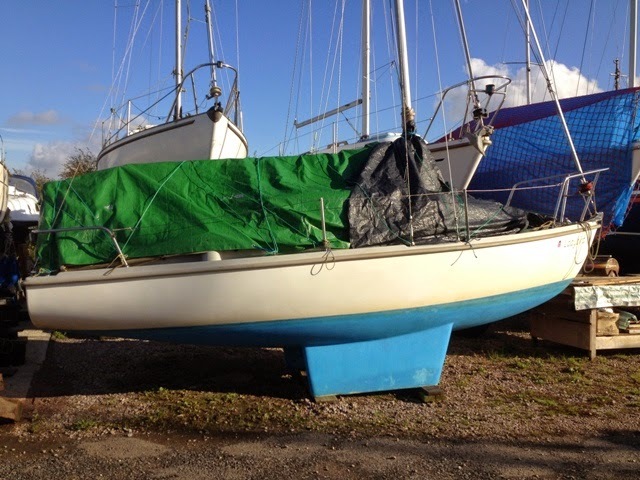 It was a disappointment for him, but he wisely came to the conclusion that these restrictions would force him to abandon his initial hopes of sailing and owning ‘Minnow’. That of course means she is still available for sale, not that I am making great efforts to sell her. 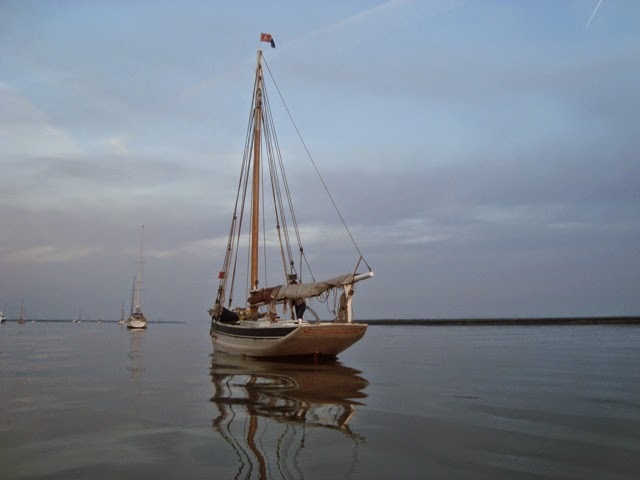 If she has not been sold by early spring of 2015, I may find that I have a renewed desire to sail her, but if not, I shall make a concerted effort to sell her. This has absolutely nothing to do with boats, and I make no apology, but it has to do with being sociable. 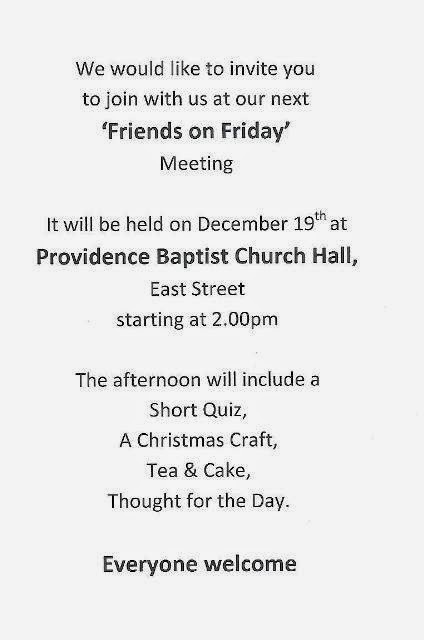 I am a member of Providence Baptist Church, East Street, Southend-on-Sea, SS2 6LH, and once a month, usually on the last Friday of a month, a few of us gather together for a social afternoon, starting at 2.00pm. This month, our meeting will take place on Friday, 19th, earlier than usual, on account of the build-up to Christmas – it’s a matter of fitting things in. To people who may live within the Borough of Southend, or a short distance from it, we extend a warm invitation for you to join us. We’ll be meeting in the Church Hall at the rear of the main building. Parking space should be available at the church, but if it is not, there’s a car park at nearby Prittlewell Railway Station. More details of what we plan to do can be found by looking at the images above. The event is entirely free, but you’ll go away with a rather nice Christmas decoration that could be used as a central piece on a dining table or perhaps on a mantelshelf. Why not invite a friend to come with you? If you discover the December Calendar on our website, ignore the entry saying Friends on Friday will be on 26th December. This is an error. We are hardly likely to meet on Boxing Day! Think back to the time of your youth. 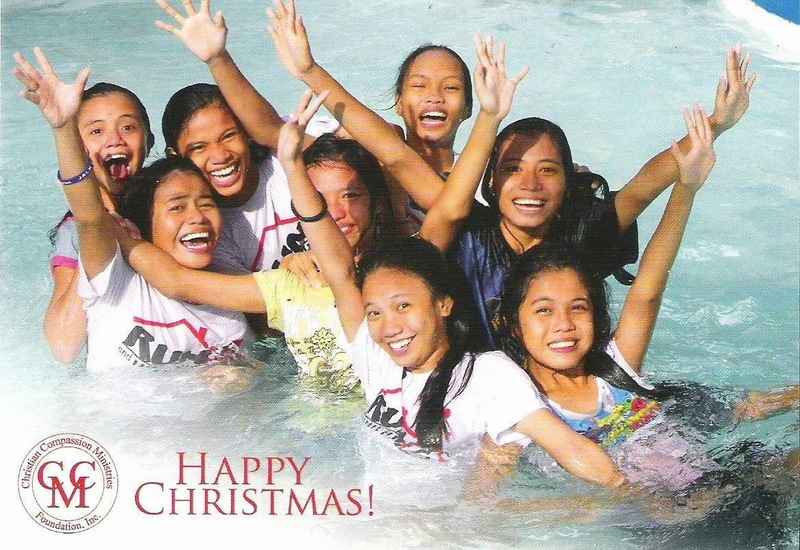 What ‘happening’ most symbolized the experience of Christmas? Was it waking up in the morning and seeing a nylon stocking bulging with goodies, hanging at the bottom of the bed? Or was it the excitement of withdrawing the contents to discover what they were? Or was it when you were with Mum and Dad, and the rest of the family sat around the table eating roast dinner and pulling crackers? Now, here’s a different question. What ‘thing’ most stands out in your memory? Is it the Christmas pudding? Is it the decorations? For me, it is the Christmas tree! 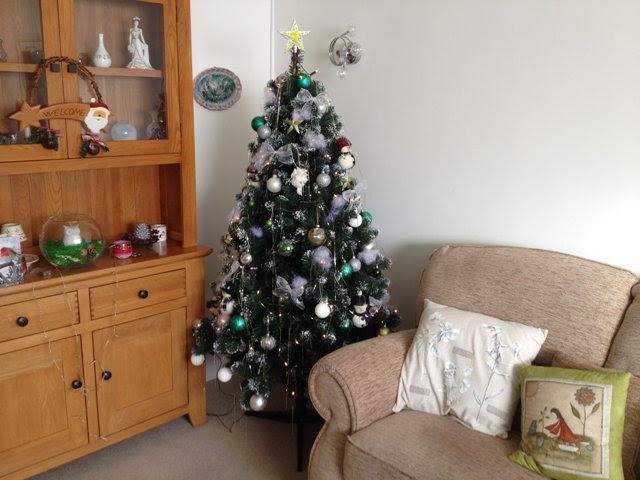 The tree would miraculously appear on Christmas Day morning. It was real, roots and all. It stood in a galvanized bucket wrapped in decorative paper. Clipped to the branches were small metal candle holders complete with red candles. Hanging from the branches were colourful baubles, and at the base of the tree there were parcels. We eagerly examined them to discover whose names were written on them. I couldn’t wait for dinner to be over, so that the candles could be lit, and for us kids to get our hands on the presents. The lighting of the candles was a magical event that transformed the tree by changing its appearance, making it vibrant. Right at the very top, there was a golden star that glistened in the shimmering light. I knew of Father Christmas or Santa Claus, as some called him, and when I was very young I really believed in him, but there came a time when I knew it was all lies. He did not exist! My trust in adults was somewhat dented, and belief had to be founded on facts. Fairy tales did not wash.
Much later when the question of believing in Jesus was put to me, I had to get hold of the facts to see if I did, or could believe in Him. When I was a kid I attended Sunday school, I went to church, and I even sang in a choir. 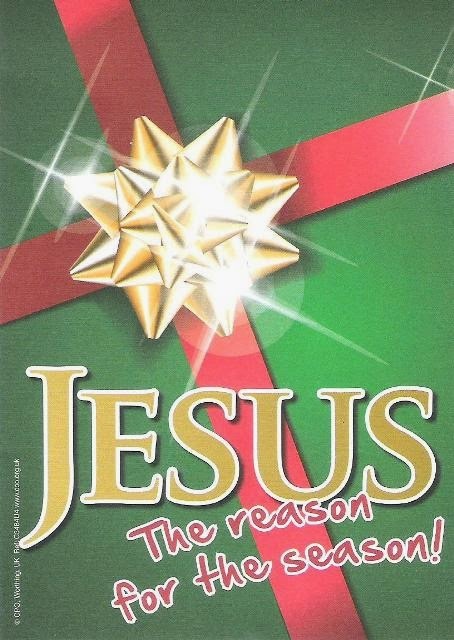 In early adulthood I thought I believed in Him because I was very active in church affairs - even taking part in meetings, attending bible study and prayer groups, ringing the church bells, making posters, cutting the churchyard grass, ferrying people to and fro, and being nice etc., etc.. 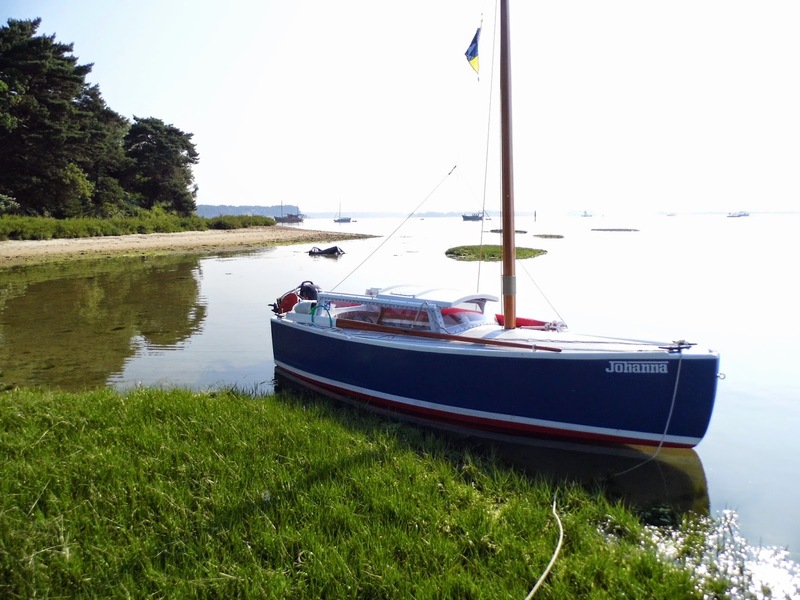 This wooden yacht is laid up near the Royal Corinthian Yacht Club at Burnham-on-Crouch. Before I bought ‘Ladybird’* I considered buying her because I was attracted to her, and she was for sale at the time. I can’t remember details regarding her designer and builder; nor can I remember if she was a one-off, or if she was one of a particular class of yacht. 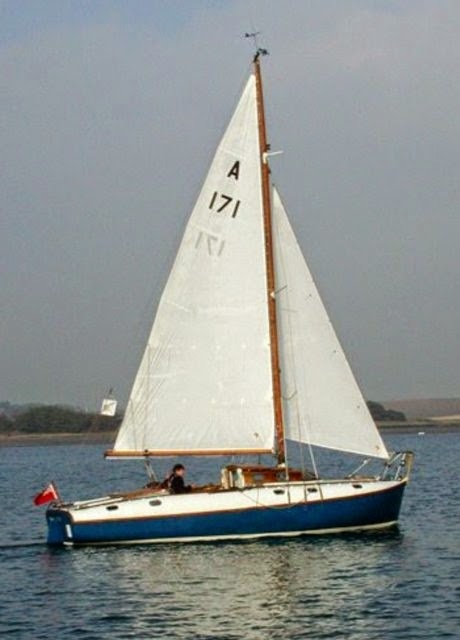 What I do know, is that she is very similar to my old Wessex One Design, ‘Shyauk’, but a little larger all-round. 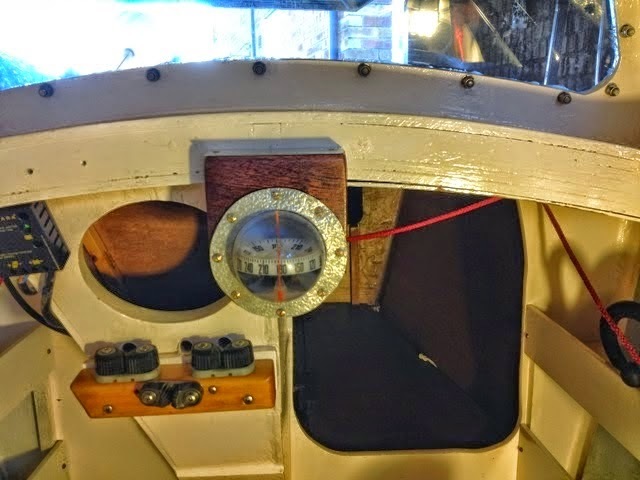 Unlike ‘Shyauk’ she has a doghouse which gives more room just where it is needed at the point of entry into the cabin and where the galley is most likely to be situated, or perhaps a navigation station with a table and drawers for charts, pilotage books etc. Again, my memory is hazy about the internal layout, but I do remember the large windows of her doghouse that allow her crew to see what is going on outside. I was put off buying her because quite a few jobs had to be done that I was unable to do well and believed I would have had to employ a shipwright to put them right. 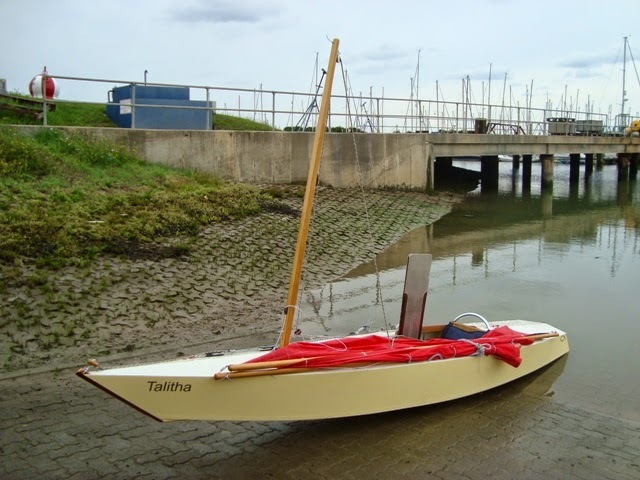 Furthermore, I realized she would be more expensive to upkeep than a smaller fibreglass boat, and although I liked the look of all the varnish, I didn’t relish maintaining it. 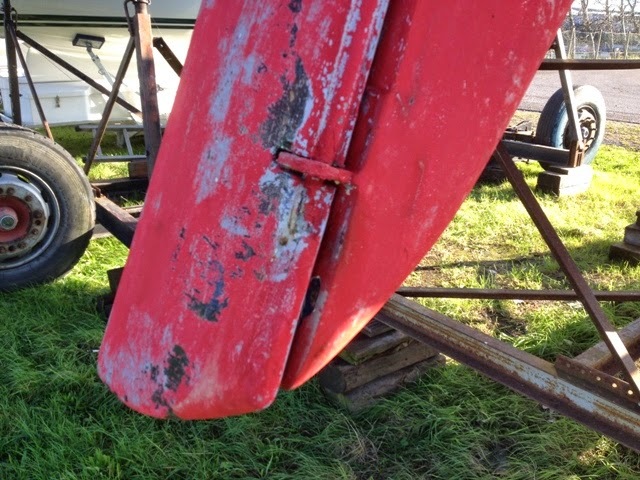 I am attracted to this type of yacht incorporating a moderate fin keel, a skeg-hung rudder and short counter. 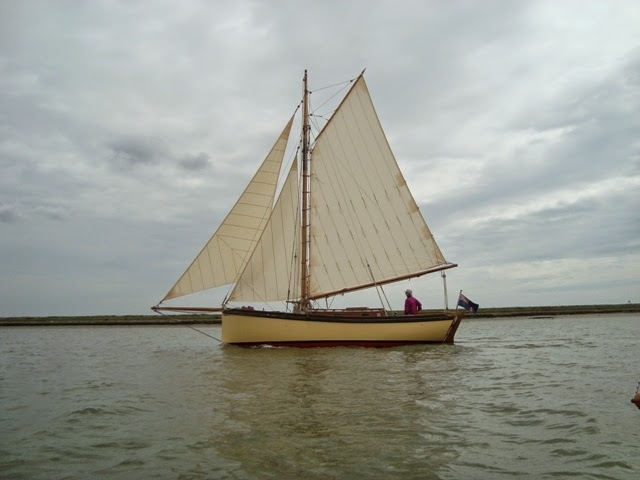 She has less wetted surface than one with a long keel, hence she’s faster because of less frictional drag, and yet she has good directional stability. These characteristics make for excellent manoeuvrability, sensitive steering and above average windward ability. 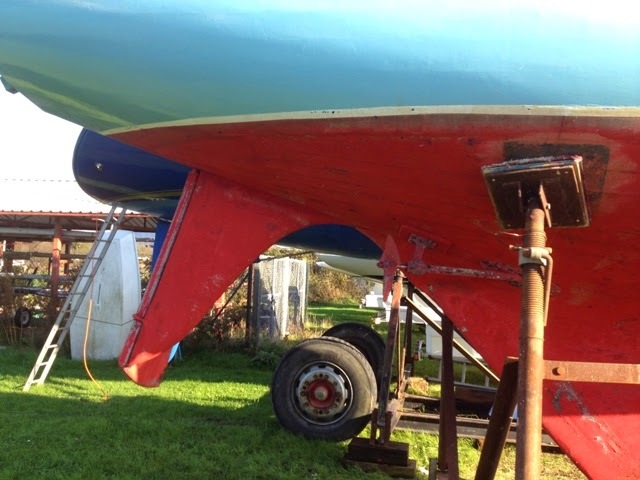 It looks as though her owner is in the process of stripping the hull of paint below the waterline to thoroughly inspect the planking and seams before making the surface good again. This sort of thing when done well can bring great satisfaction. There’s comfort in knowing the boat is sound and that she will perform as she should. 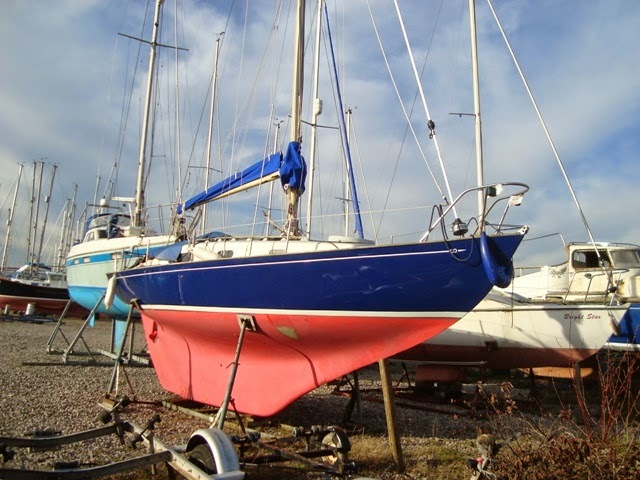 She’s a nice yacht, suitable for coastal sailing and handicap club racing. 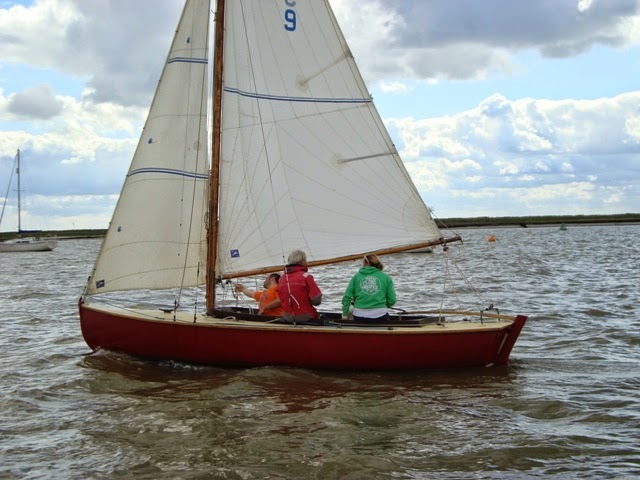 Of the boats I have owned, ‘Ladybird’, a Seawych 19, was perhaps the most endearing. On checking my blog I note that I have written many things about her and of our ‘relationship’. Only a few days ago I bumped into her again. She was not talking to me because she was in a deep sleep of hibernation. Since she is no longer mine I respected her privacy and left her alone to sit out the dark, cold months of winter. Hopefully she will be awakened in spring by her current ‘master’, dusted off and made Bristol Fashion for launching at the beginning of another season.